The client, Ralph Coleman International Ltd., had signed a lease on a site in Nuneaton to develop a new tray wash facility. One of the most challenging aspects of this project was the dilapidated state of the building. From the very outset, this had given rise to concerns and doubts from the client as to whether the project could even be achieved. 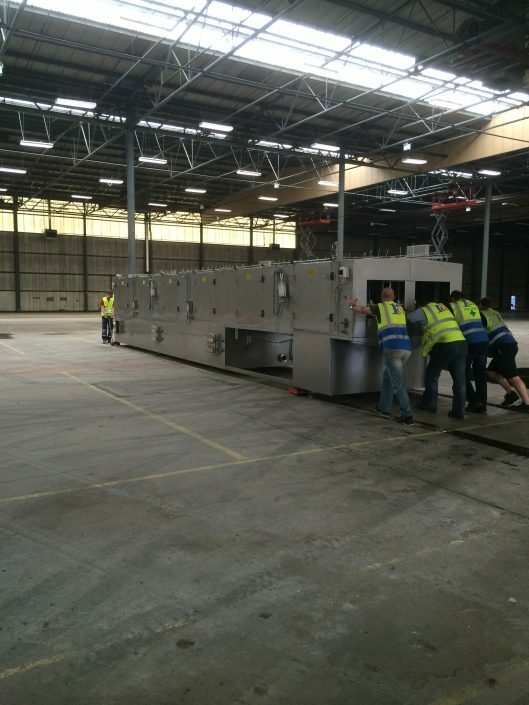 Meeting the completion deadline date was critical due to £2m of new machinery from Denmark needing to be installed. There was no room for manoeuvre in terms of timeframes – the site had to be ready on time without any delay. When you’re working on any type of old site, you need to carry out thorough health and safety checks including asbestos, electric wiring, gas supply, and water pipework and drainage. All such concerns proved problematic for this project and needed close attention before any construction work could take place. 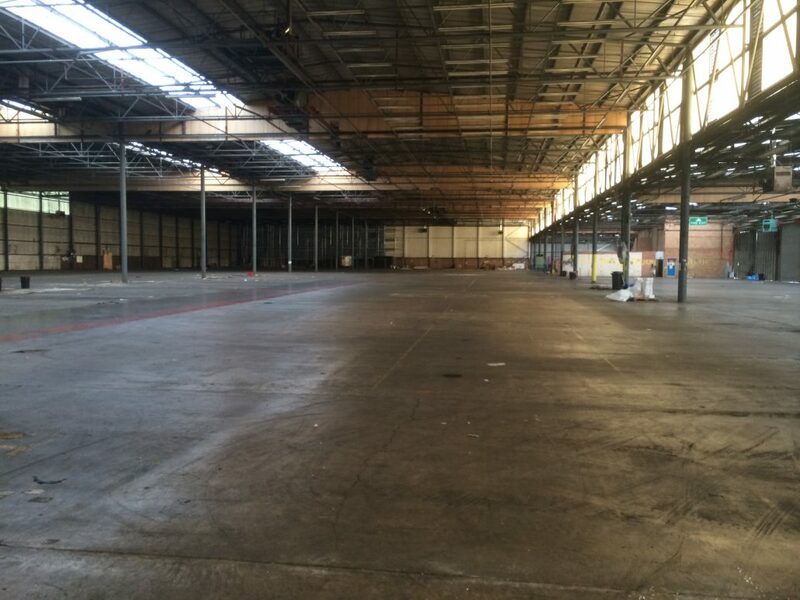 What’s more, as the factory was to be used for food preparation, we had to abide by strict food hygiene standards and regulations including the installation of food grade lighting. 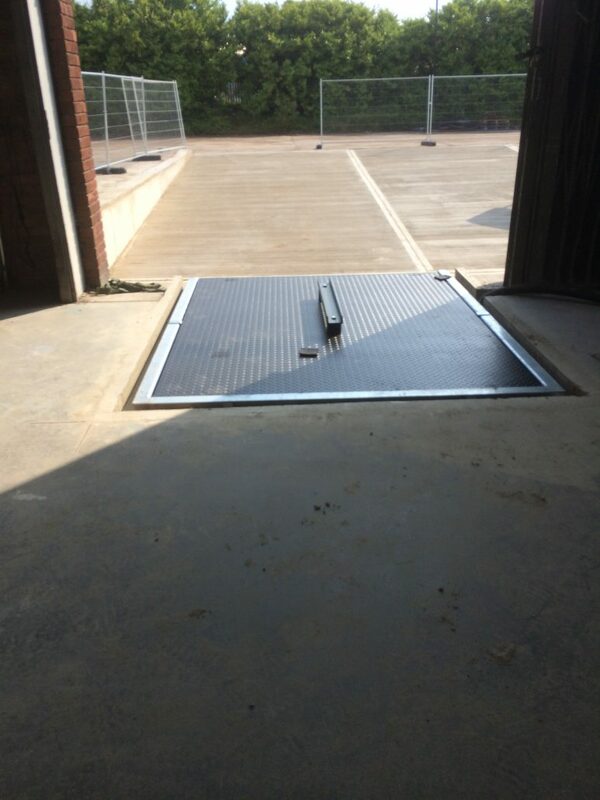 In order for the dock loading facilities to be fully installed, dock levellers had to be put in, which is a mechanical piece of equipment that allows a forklift or a pallet truck to enter a trailer backed onto the dock of a factory or warehouse. Usually, a 3m x 3m hole is dug out of the factory floor around 1m deep to allow for the dock leveller equipment to sit snugly within. Electrics are then brought to the leveller to enable power and to operate the stop/go lights outside of the building. 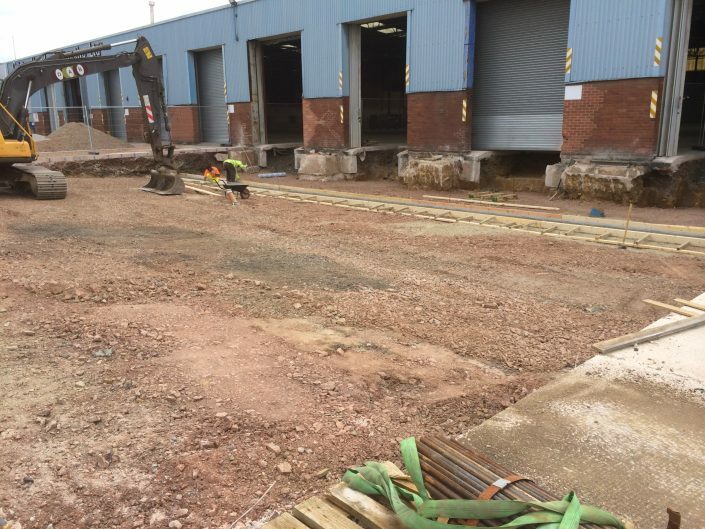 Normally, for a factory new build, dock levellers would be built in as work progresses. However, as the factory was being refurbished, this proved to be a lot more difficult as the dock levellers had to be retro-fitted. 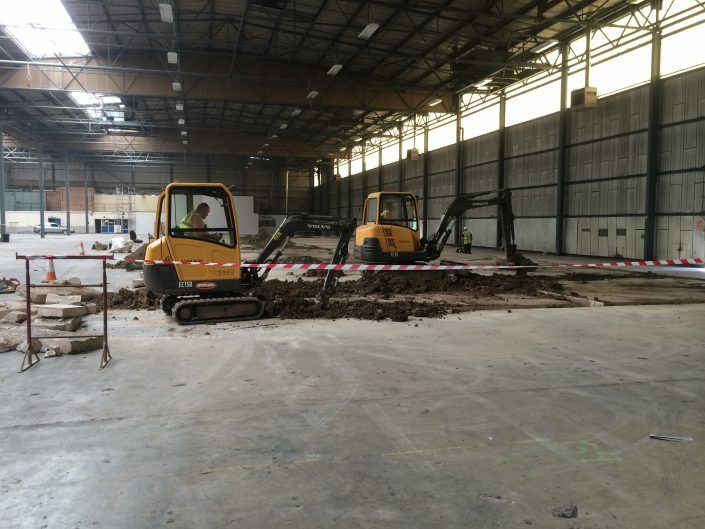 The main issue was due to the yard being the same level as the factory floor. We had to dig out a large sloped area down to 1.2m deep at the factory entrance to make sure that, when a truck backed in, the inside of the trailer would be level with the floor of the factory. What’s more, our architect had to carry out a full survey on drainage and pipework across the area. For GECC Ltd., due to our expertise, these problems were seen as challenges rather than issues. We had to reroute part of the drainage system and we had to lower manholes too. Our architect designed concrete walls to hold up the original building, plus ring beams and stanchion bases. Next, using specialist reinforced concrete, we constructed the concrete walls to the sides of the slope to hold up the original yard and we concreted the newly sloped floor. As the building was built in 1973, an asbestos report was very important. We could see that some of the areas obviously contained asbestos, but other areas had to be tested. Some building materials can look like asbestos and some materials you wouldn’t expect to contain asbestos have this highly hazardous material contained within. At one end of the building, a huge wall measuring around 1,600m2 had to be removed, as well as window sill boards and carpet tiles – plus, there was an asbestos box in one room too. Capacity and demand – as the client’s machines required such a high capacity at the far end of the factory away from the stop tap, supplying that amount of water over a 120m distance proved problematic. Pipework and flow – this issue was partly resolved by fitting 50mm pipework up, over and through the roof space and back down to the required area. Yet this still didn’t fully resolve the problem, as the flow coming into the building didn’t meet the client’s requirements. Solution – we finally solved this problem by fitting a 20,000 litre header tank next to the machines, which was permanently topped up even when the machines weren’t running. This enabled the required volume of water supply which the client needed. Gas – the building had only been partly used for the past 10 years and vacant for 10 years previous to this, which presented us with major issues in terms of the gas supply. 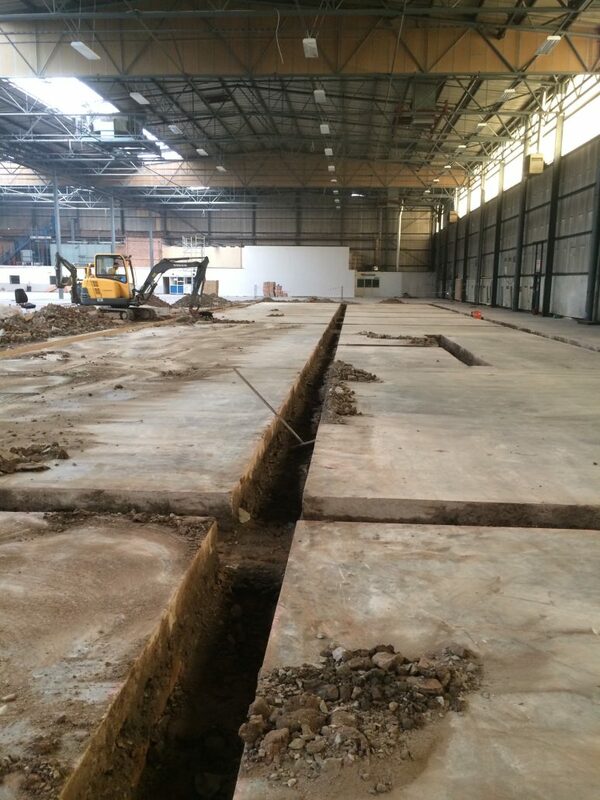 The meter and incoming gas supply were located across the far side of the site in a separate building. Test – firstly, we had to pressure test and leak-test the gas pipework from the mains supply, which went underground and came up inside the factory. Repair – we found and repaired leaks at the meter. In the factory, the supply had to be taken up into the roof space in 100mm steel pipework, across the building and, reducing to 50mm, down to the three machines below. We then had to take the gas supply over to the office area to feed the gas boiler for the office heating system. 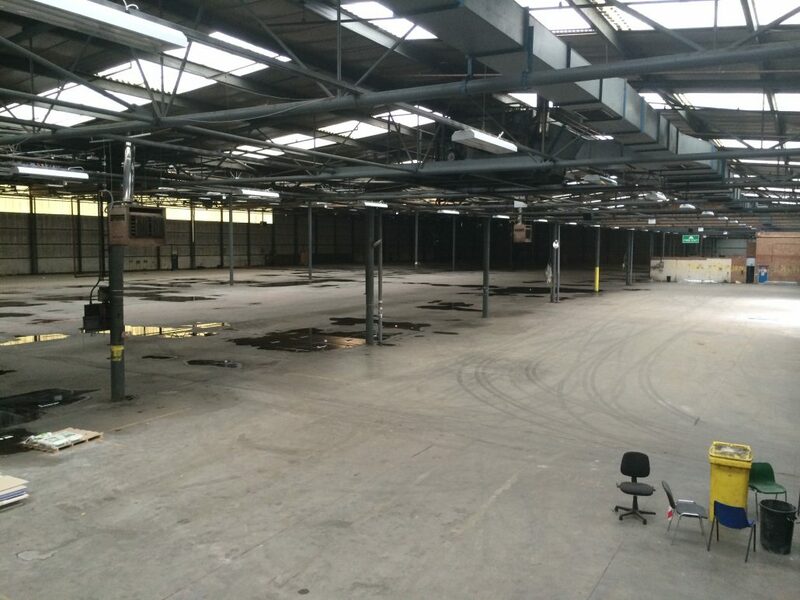 Electricity – due to the derelict nature of the building, all electrical wiring had to be checked in order for the client to have adequate heating and lighting for office areas, and the factory itself including food grade lighting for the food tray washing facilities. To provide the new power needs for the factory, a huge upgrade was needed to the mains powerboard and fuse boards. Rewiring – the office area, toilets, changing rooms and reception areas were completely rewired. 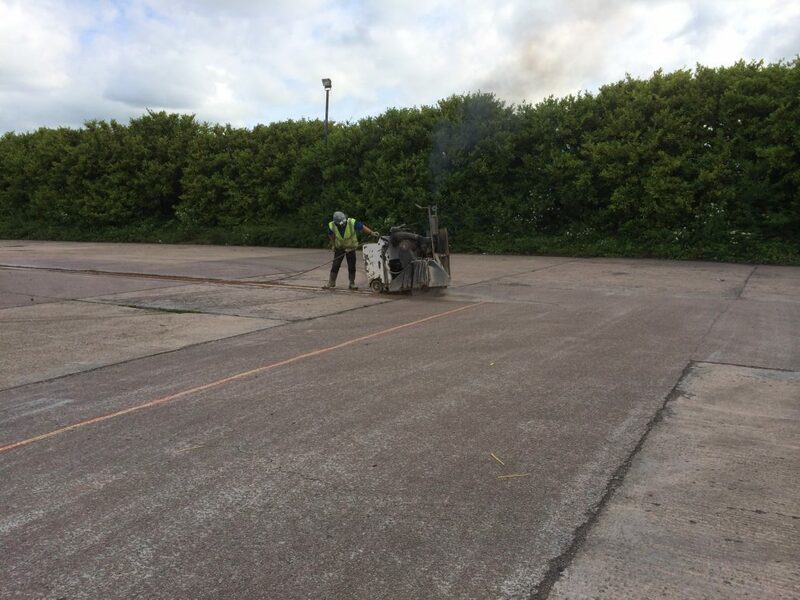 Power needed to be taken up and over to all the new machines, to the dock levellers and to the external jet wash areas. Lighting – to light up the dock loading areas and the general yard, new external lighting was needed. What’s more, new food grade lighting was required in the factory (sealed in units); a full lighting survey had to be carried out to advise us on which areas needed the different types of lighting. Alarm systems – we undertook a fire alarm survey. As advised, we had to conform to ‘code 1’ of the fire alarm practise, and the entire factory and office area were fitted with a brand new fire alarm system. Once the main building had been constructed, we fitted brand new roller shutter doors and highly durable industrial roofing. Roller shutter doors – these doors were fitted due to the various benefits for a factory including greater security and safety to staff, and reduced noise levels. What’s more, fitting roller shutter doors to commercial premises tends to add value to the property. Industrial roofing – we chose Resitrix® due to the EPDM content, which is a highly weather-resistant synthetic rubber with a water-resistant membrane. 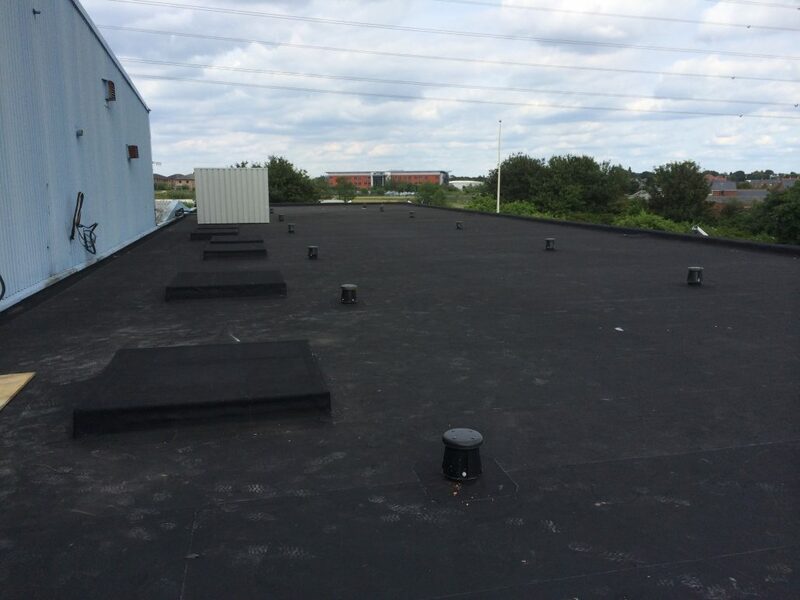 It is the perfect option for a flat roof because it is indestructible when it comes to UV rays and costly repairs are avoided as it can withstand all types of weather. As a high-quality and reliable material, Resitrix® is our first choice when it comes to fitting industrial roofing. 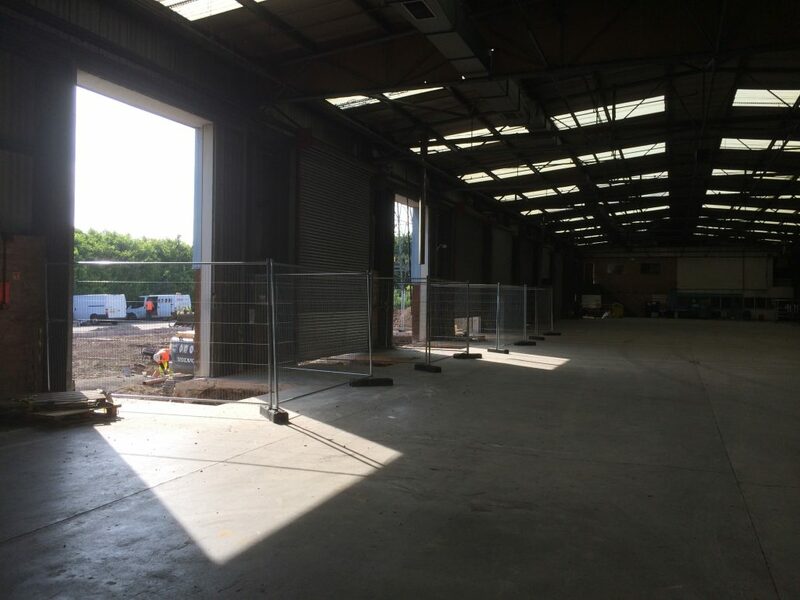 The site required an office area for staff, which included the installation of suspended ceilings and suitable partition walls to mask any noise from the factory area. Following the initial build, the client then asked us to install a canteen and locker room areas (see ‘Building Canteens & Locker Rooms on an Old Site’­­ for more details). 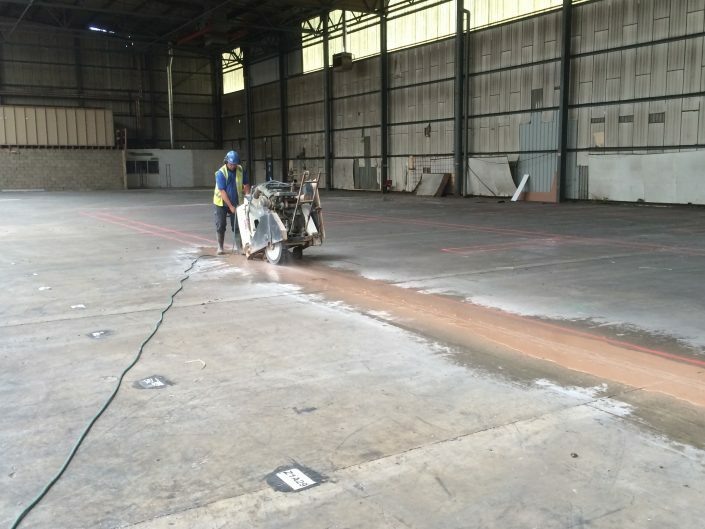 Once the site had been finished, we carried out a very thorough deep clean to make sure our client and their employees could move straight onto the premises without any delays or workflow issues. 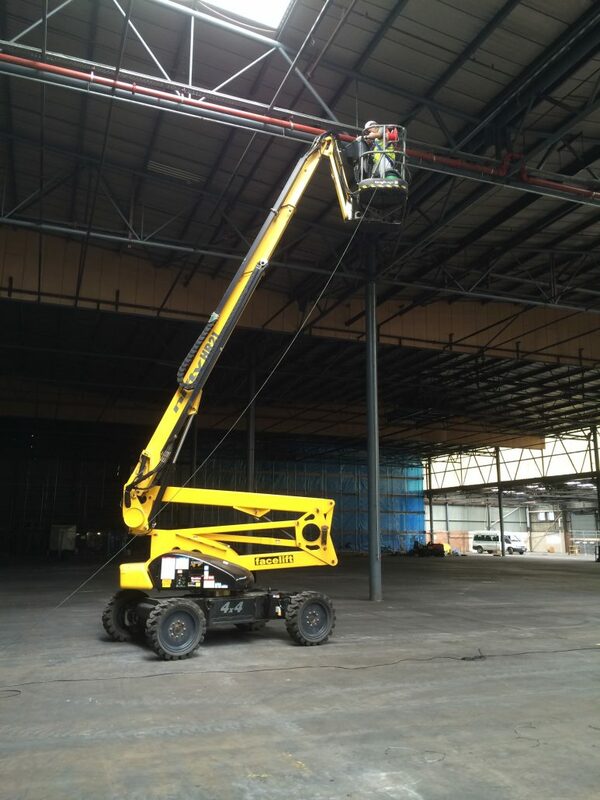 This involved ‘scissor lifts’ and ‘cherry pickers’ cleaning the whole of the roof space including ceiling tiles, cable trays, pipework and the entire steel framework within the building. Basically, any area that could potentially hold dust, which could drop into the food trays below, had to be thoroughly cleaned. Carefully considered and thorough project management from start to finish enabled our client to rest assured that any challenges were being handled smoothly and successfully. GECC Ltd. directly managed the architect, service engineers and surveyors. What’s more, following strict building and CDM safety regulations, we liaised directly with the Health & Safety Executive removing any hassle on behalf of our client. Alan Pitman, Managing Director, Ralph Coleman International Ltd. On-time – the project was completed 2 weeks ahead of schedule which meant 2 weeks of unexpected extra revenue for the client amounting to £90k. The factory now generates £5m turnover per year. Under budget – due to the seamless project management delivered by GECC Ltd., costs came in well below budget adding even more money to our client’s cash flow. All assurances met – working from a sound knowledge base and providing expert project management throughout this project meant that all reassurances given to our client were successfully met. High-quality construction – from lowering and levelling the floor to rerouting power and pipework across the site, both the factory and office areas were finished to a very high standard reflecting the professionalism of our client’s organisation. Expert surveying and removal – of asbestos, gas supply, electrical writing, water pipework and drainage. GECC Ltd. undertook highly complex challenges, resolving all issues to our client’s satisfaction and beyond. Find out more about GECC Ltd., factory refurbishment or office refurbishment – please call 01455 616390.